Jack Bernhard’s Decoy has built up quite a reputation in recent years. Considered a “lost” film for decades, it was written about in several books about film noir, and its perversity and violence were marveled over, as well as the coldness of its femme fatale. 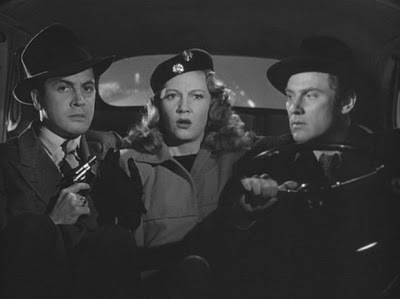 When a print of the film was unearthed and shown as part of the Second Annual Festival of Film Noir in March 2000 at the Egyptian Theatre in Los Angeles, the audience reportedly went wild. Film critic Glenn Erickson (who also does a commentary track on the DVD) wrote that “as far as violence goes, Decoy was to 1946 what Pulp Fiction is to 1994.” I’m not sure if this is true. Certainly in terms of cultural impact, Quentin Tarantino’s films made a much larger splash in the ’90s than this picture did at the time of its release. And it’s hard to compare Tarantino’s films — which are incredibly self-aware, and which owe so much to every decade of film history that preceded them — to this unselfconscious programmer. When the film begins, we see Dr. L.L. “Lloyd” Craig (Herbert Rudley) staggering out of a gas station washroom in the early dawn hours. He hitches a ride into town, and heads for a particular room in a hotel. Once he’s inside, we hear shots. Police sergeant Joe “Jo Jo” Portugal (Sheldon Leonard) rushes down the corridor. The doctor is dead, there’s a wooden box with the lock shot off (MacGuffin alert! ), and Margot is lying on the couch, wounded. When Jo Jo hands her the box, she laughs and weeps, and generally acts like a petulant child. In classic noir fashion, she narrates her own story as she lies dying. Her boyfriend, gangster Frankie Olins (Robert Armstrong) was set to die in the gas chamber, which didn’t make Margot happy. Not because she was going to miss him after he was dead, but because only he knew where the $400,000 take from a robbery was hidden. In a convoluted scheme, Margot seduces gangster Jim Vincent (Edward Norris), who has already sunk $45,000 into an appeal for Olins that failed, and gets him to engineer the removal of Frankie’s body from the prison immediately after he dies in the gas chamber. She also seduces Dr. Craig, cajoling him away from his free clinic and his nurse (and possibly girlfriend), who is played by Marjorie Woodworth, whose acting is delightfully terrible. After he’s brought back to life, Frankie staggers around like Frankenstein’s monster, even lighting a match at one point and staring at it as though he’s never seen fire before. By the time he breaks down and says, “I’m alive,” it feels as if an hour has gone by. Movies like this all get lumped into a big pile now labeled “film noir,” which is a good designation, and one that’s stood the test of time. It was first used by French critic Nino Frank in 1946, but was completely unknown in Hollywood when “film noirs” were actually being made. 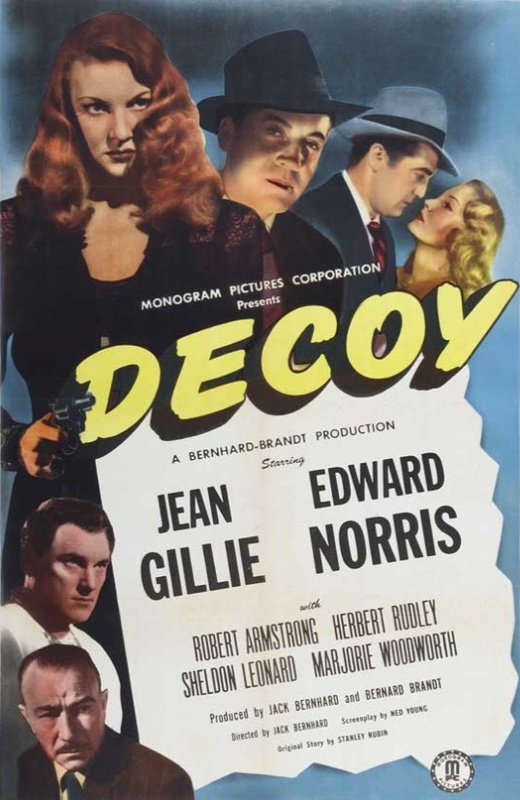 Movies like Decoy were called “melodramas” (or sometimes “thrillers” or “suspense” movies) and melodrama is actually a better term to describe this movie than noir, which implies a grander style than Decoy exhibits. The sets are bare bones, the plot is ridiculous, and the acting is campy. There are plenty of night scenes and a few shadows lurking around corners, but in general, the lighting is more utilitarian than chiaroscuro. This is not to say that Decoy isn’t a lot of fun. It is. And the plotting is clever, especially the “gotcha” ending. But it’s far from a masterpiece, and it’s too silly to be taken very seriously. *Although both Erickson and Lyons make the claim that Margot runs her victim over with her car “repeatedly,” I’m not 100% convinced that there are two different prints of this film in circulation. The power of suggestion in horrific or violent scenes is a powerful thing, and it can trick the audience, especially after a single viewing of a film. There are critics who swore up and down that they saw the knife slashing Janet Leigh’s skin in Psycho (1960), even though it never actually does, and several critics have memories of seeing a horrific demon baby at the end of Rosemary’s Baby (1968), even though the baby is never shown. Posted in 1946, September 1946 and tagged Bernard Brandt, Bernhard-Brandt Productions, Bert Roach, Carole Donne, Decoy, Edward J. Kay, Edward Norris, Film Noir, Herbert Rudley, Jack Bernhard, Jason H. Bernie, Jean Gillie, John Shay, L. William O'Connell, Marjorie Woodworth, Monogram Pictures, Nedrick Young, Pathé Pictures International, Philip Van Zandt, Robert Armstrong, Rosemary Bertrand, Sheldon Leonard, Stanley Rubin. Bookmark the permalink.